Nick Twist. Combining outstanding balloons with amazing magic. My name is Nick Chapman, also known as Nick Twist! I have been obsessed with magic almost all of my life. Like many others, I received a magic set from my parents when I was 5 years old. However, unlike many others, I have never stopped making magic since! I twisted my first balloon – a standard balloon dog – when I was 12. Now in my mid thirties, I feel I have honed my skills as the performing character of Nick Twist! Want to know what I currently offer? Take a look here! 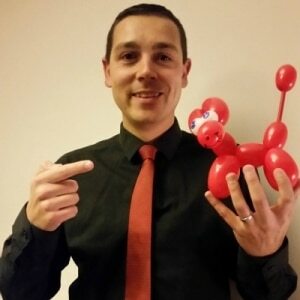 I started as a magician but have found that combining balloons into the magic to be amazingly unique, exciting and entertaining. The journey to mixing them both was long. In brief, I started to enter talent contests in my local area at the age of 14. I was surprised to find that I was quite successful and decided to go big! I started to build and buy some stage illusions, hire an assistant and really go for it! I formed a magic and illusion act called Dezaar. 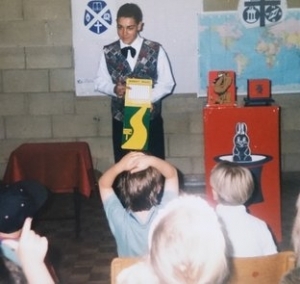 In the mean time, my Mum was driving me around so that I could perform children’s magic shows at parties and company Christmas events. I was really getting busy, especially with the talent contests. Nick Twist’s apprenticeship years! Some of these props still feature in today’s shows! Entertainment agencies started hiring us to perform at Holiday centres and hotels across the East of England – my career had begun! I was also asked to perform a solo magic show, without the illusions, and was asked for my stage name. Well I didn’t have one for only myself so I decided on the name of Nicholas Mann. I felt it was my ‘showbiz’ than my regular name (Nick Chapman) but I soon dropped it. I realised it sounded like I was a man wearing no underwear! Nicholas Mann; it sounds so obviously silly, but I didn’t even consider it at the time! Anyway, in 2001, I earned a 6 month contract performing on a ship in the Baltic Sea, performing acts every night whilst on board. I was also hired by a ferry company to perform an adult caberet show at night, and 6 children’s shows a day! That’s right, 6different children’s shows a day. This was when I decided to create a half hour balloon show – I needed more material! I really enjoyed the balloon show and felt I would love to take the idea further. This resulted in my Nick Twist character and show. Where do you perform now? After ‘earning my wings’ in the holiday centres, I now perform at weddings, hotels, private parties and corporate events. I love engaging with the children at these events . 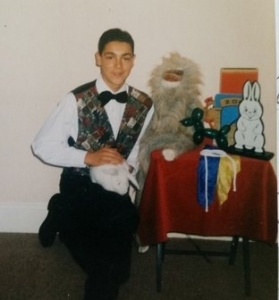 I try to ensure really strong magic in my shows – many don’t expect it in a children’s show but I really believe in powerful magical moments taking place from time to time in my show. I also perform for adults at these events and love it when adults come and ask for balloons. It is a misconception that balloons are only for children. Believe me, adults love them but they often have to wait for one brave adult to ask me before they all get the ‘go ahead’ to go get a balloon! What has prepared you for your events? Dezaar’s first professional promotional photograph used around the Holiday centres of East England during the late nineties. 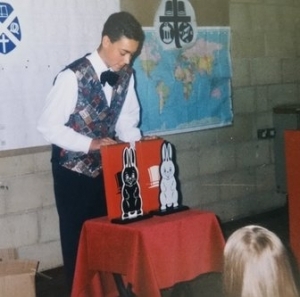 I’m a really solid choice for a children’s show entertainer as in addition to the above past learning I have the the additional experience of being a qualified science teacher for over 13 years. I’m also a father of two children making me a truly perfect candidate for a children’s show. With adult entertainment, I’m a manager in my day job and I’ve found that using these skills when performing for adults valuable. I’m able to adapt my style to suit the audience in front of me and I feel comfortable amazing adults with my strong, Magic Circle London qualified, magic. I hope this short article has helped to let you know a little more about my background. I hope that you have found it useful and realised the huge amount of hard work which has gone into my performing act. I am so passionate about having the greatest shows and acts, regardless of the audience age. I hope too that you chose Nick Twist for your next event. Nick Chapman (AKA Nick Twist).